For many years, pottery and ceramics have been proudly made by the hands of highly skilled craftsmen in Boleslawiec, Poland. One of the products these craftsman produce using traditional ceramic techniques is the Fermenting Crock Pot. Each crock is handmade and decorated using a unique method of hand-stamping. They are made from regional, enriched vitrified* clay providing a very strong, yet elegant building material. The pot is finished with beautiful lead-free glazes. 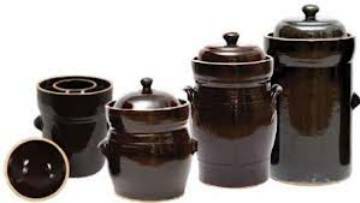 These crocks are built to produce sauerkraut, Kimchi, pickles and other fermented vegetables for many years. Natural lactic acid fermentation is one of the oldest and healthiest means of food preservation. It allows natural, beneficial bacteria to perform a fermentation process in which vegetables develop a pleasantly sour taste and remain rich in vitamins and minerals. Lactic acid fermentation is the only method of preservation that retains all the natural plant ingredients while improving the quality, taste and aroma. To determine which size pot is best for you please remember you can only fill a pot to 80% of its total capacity.